I wrote this song in 1983, but recently revived it. It is a song about Love and love for the Lord. It is Modern Country, POP, Contemporary, Folk, and Christian Music. RM3 - is Rocky Mountain Majestic Music and the work of Steve Parke. Steve has been playing and writing music for many years and his heart for the Lord is in his original music. He plays guitar, keyboard, bass, and violin, plus sings. RM3's new song called: "I Know You're Out There" Steve played and recorded all the instruments, arranged and produced the song. Plus sang all the vocals, lead, background, and harmony vocals. He wrote the song in 1983, but recently revised it. 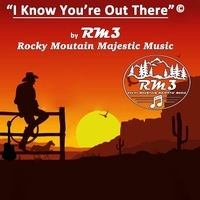 You can also buy the World Wide Single Release of "Call Of The Lord" and the new Single "I Know You're Out There" at http://www.cdbaby.com/cd/rm3rockymountainmajestic2 for 99 cents each and all proceeds from the sale of the MP3's will go towards the cost of recording the Album professionally. Steve hopes that folks will enjoy his music and support what he is doing to bring his "Music with a Message" to the World, and to help him make his dream come true. Which is to professionally record the Album in Nashville. RM3 needs to sell about 20,000 copies of the MP3 downloads for this to happen. The song is also for sale on CD Baby, Amazon, iTunes, Google, Spotify, and many more.